The steel body of the Fastloc collet system can be mounted onto the duplex chuck jaws (DJ45 to DJ90). Alternatively, an accessory can be purchased (the DAH38) that fits into the body of the duplex chuck and holds the Fastloc body with great accuracy. 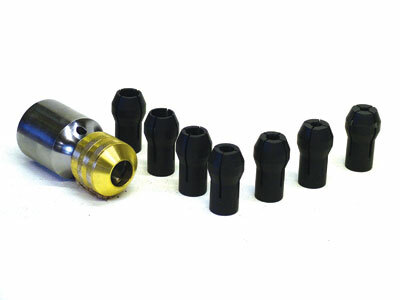 If your lathe has an M33 x 3.5, 1in x 8tpi or 1 1/4in x 8 tpi spindle thread, the Fastloc collet system can be purchased with a threaded body to fit directly onto your lathe's spindle. 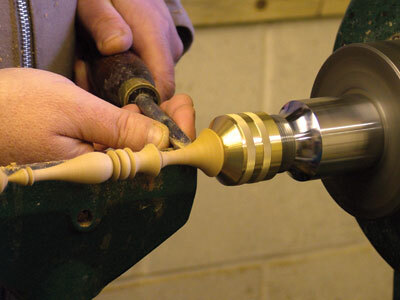 I turned a small finial using the 14mm collet and found it gripped well and accurately. This method of holding work is ideal for those who like to turn doll's house furniture, jewellery, or any small or miniature work. A useful tip for turner's who have a hollow spindle and need to turn a number of items identically, is to turn a long length of dowel and feed it through the headstock spindle. Grip the length you need in the fastloc chuck, turn it and then part off. Loosen the brass collar, feed the next length through, tighten the collar and turn the next piece. I found this to be a great time saver and I hope you also find it useful. "The Fastloc collet system can be purchased with a threaded body to fit directly onto the lathe spindle"